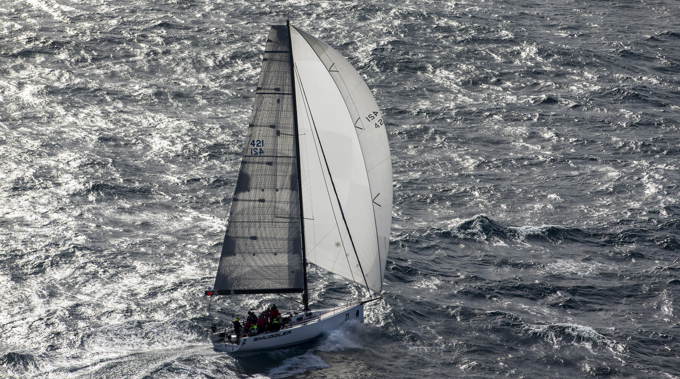 Sebastian Bohm’s Rogers’ 46 Smuggler is the IRC overall winner of the PONANT Sydney Noumea Yacht Race, the race committee comfortable the Sydney boat can’t be toppled though the majority of the fleet is still to finish the epic ocean passage. The fast running and reaching race proved ideal for the Rogers design and high calibre crew. “We haven’t a lot of tight reaching in big seas before and the boat handled it perfectly,” said Bohm, who bought the boat in 2015 and named it after the Adelaide band ‘Beat Smugglers’ he used to play in when they supported big music acts like The Black Eyed Peas. Rain clouds were the only time Smuggler stalled, a frustrating interruption when the crew knew how close the top four contenders were. Days of hard-pressed reaching and focusing on the IRC win did take its toll: “By the time you get to day three and four everyone is tired. You dream then wake up suddenly realising you are on the boat crashing along,” Bohm recalled. Second on IRC overall results is GBP Yeah Baby (Marc and Louis Ryckmans) and third is Tony Kirby’s Patrice. Steve Capell’s Eve leads IRC division 2 standings and Richard Harris’ Sticky is the division 3 front-runner currently. Sibby Ilzhofer’s Farr/Cookson 47 Dare Devil arrived Friday morning, June 8, and Ian Edwards’ Wings and Rob Aldis’ Kayimai during the afternoon. Those still on the course are revelling in the fresh Coral Sea tradewinds dominant for most of the Cruising Yacht Club of Australia organised 1,064 nautical mile race. The fleet can be continuously tracked via http://noumea.cyca.com.au/standings/ and regular updates are being posted on the CYCA’s social media channels.